The MSO2000 and DPO2000 Series digital phosphor oscilloscopes (DPOs) deliver the performance and tools you need to visualize your signals and find answers quickly. 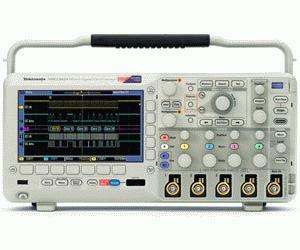 The DPO2000 Series are the first oscilloscopes to provide 1 M points of usable record length on all channels, serial trigger and decode analysis options, a variable low-pass filter that also allows you to see signal details to the oscilloscope’s full bandwidth and all in a compact form factor. The MSO2000 Series adds 16 integrated digital channels, enabling you to visualize and time correlate analog and digital signals on a single instrument. This integration extends triggering functionality across all 20 channels – which is ideal for debugging mixed analog and digital designs.